I want to share a story. It’s a simple story, but one rife with deeper implications and meaning. I know a homeless man. Fred. I’ve been running into him recently, and multiple times. When I first met him, a couple of weeks ago, I bought him a burrito … and it happened to be when it was his birthday! He was hungry, and so the burrito hit the spot for him. I got to know him some in that encounter, and I was amazed at his humble spirit and attitude. I certainly wanted the best for him. Fast forward a little bit, and I run into him at the Pride Festival. I get to know him more, and see his sign, something to the effect of, pride is serving others. I talk to him, and am happy to talk to him. The experiences are meaningful and purposeful. He always hugs, which is an added bonus. It really solidifies our friendship and kinship. Fast forward some more. I’m passing him as he’s headed to DI to look for some supplies to fare better on the streets. At this point, my heart is hurting intensely for him, the earthly attachment real and in-your-face. I need to see if I can do more. I’ve bought him a burrito, I’ve given him company, I’ve been kind to him, but I wonder if I can do more. So I talk to him a little bit, and then start talking to him about The Legacy Initiative, that I work for. I tell him that I can leave a message for the humanitarian team, to see if they can get him things that he needs. Sure enough, he’s down with this idea. So, we compose a message together, asking for supplies, such as a cooler, a sleeping bag, and other items that come in handy when you’re on the streets. I post the message on Facebook, and tell him, no promises or guarantees because things are contingent, but we will do what we can, that I promise. In the meantime, I’m thinking about this guy a ton, wondering what more I can do, wondering what his story is, wondering how I can serve this man who has not allowed his spirit to be broken yet by the streets. And sure enough, later that day, after the team knows what’s going down, that Fred needs help, I run into Fred again walking back home from the library. It’s karmic, I’m telling you: The idea where your past actions influence your future, past causes having ripple effects in the future, as understood by the Hindus. I tell him the good news, that we might be able to get him a sleeping bag. 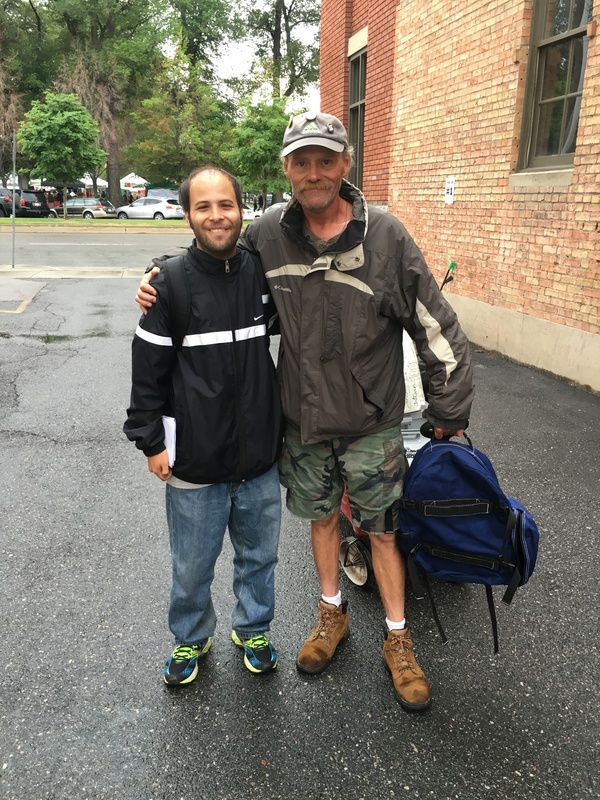 He’s delighted at the news, and with some courage on my end (I’m afraid he’ll see it as a bad or untenable/undoable idea), I invite him to come to the outreach tomorrow, the Feed the Streets Outreach I do once a month with Legacy Initiative. He tells me he’ll make it, but after much reluctance. I tell him I understand, I tell him, there’s no pressure, but I tell him it’d be nice if he comes, because he’ll get to surround himself with people who care about others and care about enriching the community. And they might be able to help him. Really, I’m thinking I want him to know people care for him, but I’m also thinking we might be able to get him some necessary supplies. Kill two birds with one stone … yikes! What a terrible metaphor! I love birds! Anyhow, fast forward to today, when I head to the outreach. Sure enough, Fred shows up. I’m relieved and happy beyond words, and I’m very touched. I can see some of the apprehension in his face, but he took a chance, he decided to trust me even though all I had was my word. And sure enough, Stephanie loads him up with a cooler, a sleeping bag, a tote, as well as some water and burritos. I introduce him to Travis and Tracy, and they talk, and it’s great. He tells one of his most impassioned stories (this guy has a lot of stories to tell, in the best sort of way). He pulls out his blanket, and explains that state troopers in Nevada gave it to him. They gave it to him directly because they were aware of the corruption in the shelters there. They wanted to make sure that the people they were serving were really being served, and getting what they were supposed to get. Because unfortunately, the people who are supposed to be served by organizations and shelters, let them fall through the cracks. It’s tragic, but Fred shared his story with bravery and courage, open-heartedness. This is his experience. This is this man’s singular experience. But as he explained later, he’s not jaded by the streets, and he doesn’t plan on allowing that to happen. He’s strong, open-hearted, and free. He believes in himself and in others. He described how he won’t sell any of the stuff we gave him, because that’s not right, and what we’re doing for him means a lot to him. I imagine for someone who has been on the streets this long, this must be meaningful and must give him hope, especially when he can’t stay at shelters because of thievery and drugs, among other problems. So he’ll be out on the streets all upcoming winter. I wanted to share this story to convey this man’s experience. He can write about it himself, of course, so I have no extra privilege over this man’s story, but I do hope I’ve communicated my understanding and the meaningful exchange, and communicated this experience, because as a writer, I seek to share these important things. I seek to connect and share the details. Call it karma, if you will, but it must be done. I told one of the people who volunteered with us on our outreach that that’s why I write: I write to connect. Not everyone understands this, or even empathizes with it, and it prevents me from making the kind of success that people believe I should be striving for, but I don’t care. And he told me just do what makes me happy, even if it’s the harder route. If connection is more important, then that should be my goal, and that’s why I wrote this piece, “Karmic”: Because, I wanted to communicate Fred’s experience. And speaking honestly, there’s no telling how this piece will ripple in the water and affect the future. But I’m not sure I’m worried about that. I have enough faith in it. I said goodbye to my friend, but not without telling him how much I was glad he came out to see us. He reiterated again that it took strength to come out, but that he was glad that he did, glad that he trusted me. I couldn’t help but appreciate that he did come out, because I couldn’t imagine his fears. Yes, people on the streets get burned all the time, but he chose to take a leap of faith, and it hopefully placed him in a better position than he would have been. It’s karmic, like I said. This stuff is meant to happen, I’m telling you, we’re meant to cross paths, we’re meant to connect on such fundamental levels. It’s what we do as human beings. And yes, I can’t say how my actions will affect the future, and I don’t know how Fred’s actions will affect the future, but I’m not worried, because I trust this guy, and wish him only the best. And, he has dreams. He gave me the blueprint to his homeless mobile home, potentially constructed with two wheelchairs and other supplies. He deserves better. He gave me the blueprint out of trust and faith. I think it’s a great metaphor for what happens when people connect. When you connect, anything starts to seem possible, and a blueprint can become reality: the seeds of dreams are planted, just waiting to blossom as reality. We just have to continue to work together and let our actions and deeds speak for themselves. That, my friends, is where it’s at.